One of the most fascinating groups to grace the 90s and beyond, Grandaddy never achieved what you would call mainstream success, but they made up for it in terms of accolades received for their exquisitely unique music and songs. Without doubt, their influence and originality is felt and made its mark on many of today’s most compelling artists: Midlake, who recently backed Grandaddy front man Jason Lytle for a few shows, have long sung Grandaddy’s praises, as have Modest Mouse, which includes Grandaddy guitarist Jim Fairchild, Conor Oberst, MGMT and The National. Others admirers include Jeff Tweedy, Super Furry Animals and Snow Patrol who opened for Grandaddy in their early days. Even David Bowie was seen attending some of Grandaddy’s shows and spoke highly of the group’s classic 'The Sophtware Slump'. Originally released in 2000, 'The Sophtware Slump' is now being given the deluxe treatment with an entire second disc of bonus material selected by Jason Lytle and Jim Fairchild who also provide illuminatingly honest sleeve notes. Disc Two rounds up non album singles, b-sides, EP tracks and contemporaneous flotsam plus two previously unreleased demos for ‘Beautiful Ground’ and ‘Hewlett’s Daughter‘ and the original intro, discarded before release, of the album's magnum opus 'He's Simple, He's Dumb, He's The Pilot'. While the original album is left intact, the bonus tracks simply add to 'The Sophtware Slump’s' entrancing, breathtaking charm and offer a more complete picture of the band's creative output during this important period in its history. Lytle founded Grandaddy in California in 1992 with bassist Kevin Garcia and drummer Aaron Burtch. Lytle took care of the songs, vocals, guitar, and keyboards before expanding its line up in 1995 to include guitarist Jim Fairchild and keyboardist Tim Dryden. Following a productive run of self-released recordings, Grandaddy made their independent label debut in 1996 with 'A Pretty Mess By This One Band', a mini-LP released on the Will Records label. It’s now available (with the ‘Machines Are Not She’ EP) under the title 'The Broken Down Comforter Collection'. The full-length album 'Under The Western Freeway' followed in 1997 and led to a recording contract with V2 Records. The first fruits of this were the four-song EP ‘Signal To Snow Ratio’ in 1999 and the group’s second full album 'The Sophtware Slump'. The band’s prolific creativity was never solely contained by their albums, resulting in a wealth of compilation material, EPs, singles and split singles throughout their career. 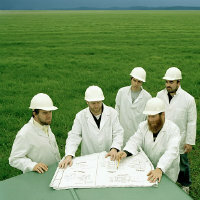 Following the watershed 'The Sophtware Slump', Grandaddy did release two more full-length albums, 2003's 'Sumday' and 2006's 'Just Like The Fambly Cat' but the group disbanded as the latter was released and ceased touring. Lytle relocated from California to Montana, eventually re-emerging in 2009 with his first proper solo release, 'Yours Truly, The Commuter'. As well as playing guitar in Modest Mouse, among others, Fairchild has released two albums under the name All Smiles. In addition to his solo output, Lytle, with Grandaddy drummer Aaron Burtch also recorded with the California duo Earlimart under the name Admiral Radley in 2010. Besides participating in Admiral Radley, Aaron Burtch continues to produce a steady stream of original artwork and is also a member of the Good Luck Thrift Store Outfit. Grandaddy are back with a new track. Grandaddy will reissue 'Under The Western Freeway' to celebrate the album's 20th anniversary. Grandaddy have released a video for Brush With The Wild.